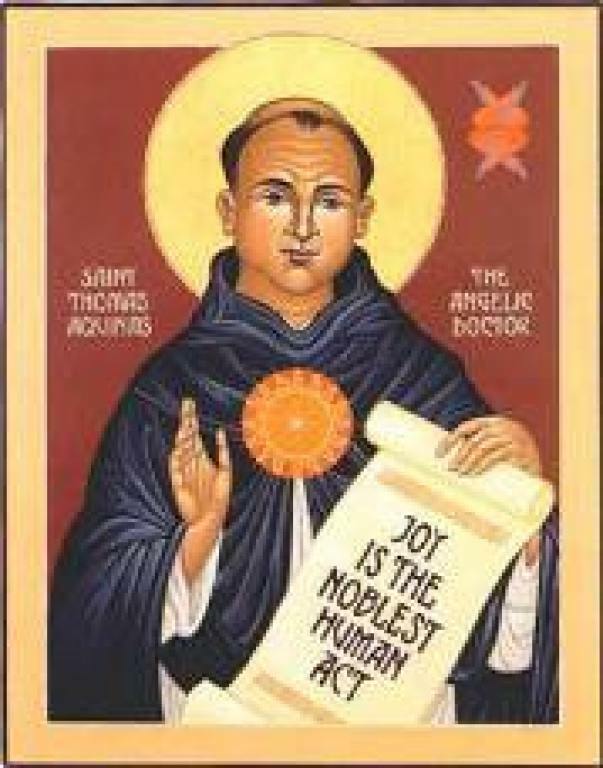 The patron of the Church of Saint Thomas Aquinas is known as The Angelic Doctor but was born in 1225 as Thomas of Aquino at Castle of Roccasecca located 60 miles southeast of Rome. He is considered by many Catholics to be the Church's greatest theologian and the father of a school of philosophy that was the approach of the Catholic Church for many years. His uncle was abbot of the Benedictine monastery at Monte Cassino. It would have been expected of him—as the younger son of nobility in the 13th century—to follow his uncle into the monastery. So at the age of five, Aquinas began his education at the monastery. He excelled in his studies and was sent to the University of Naples at the age of ten. While there Aquinas came under the influence of the Dominicans, an order following a lifestyle of few material possessions. Aquinas's change did not please his family. While traveling to Rome, his brothers seized him, took him to his parents, and held him captive for two years. He held firm to his new convictions, and not until Pope Innocent IV intervened did his family give up. He went on to study theology at a Dominican school in Cologne and the University of Paris, where he received a bachelor’s degree of theology at the age of 23. For the next two decades, Aquinas became a lecturer, teacher of theology, advisor of popes and kings, preacher, and writer. He even became a student again to receive a master’s degree. All this time, Aquinas worked diligently on his great literary work, the Summa Theologiae. While celebrating Mass on December 6, 1273, Aquinas had a mystical experience. At this point, he set aside his work, Summa Theologiae. When asked why he had stopped writing, Aquinas replied, "I cannot go on . . . All that I have written seems to me like so much straw compared to what I have seen and what has been revealed to me." In January 1274, Aquinas was traveling to attend the Second Council of Lyons. On the way, he became seriously ill. After a lingering illness of seven weeks, Aquinas died on March 7, 1274. In 1319, the church began preliminary investigations to Aquinas's canonization. On July 18, 1323, Pope John XXII pronounced Aquinas' sainthood. His feast day is celebrated on January 28. Aquinas was a large man with a dark complexion and a receding hairline. People described him as refined, easy to talk to, and lovable. He was known for his self-control and ability to express his thoughts systematically, clearly, and simply. He won over his opponents by his personality and impressed them with his power of memory. When absorbed in thought, he often forgot his surroundings. Aquinas studied the teachings of Aristotle and became a believer in his approaches to analytical thinking. Scholasticism was a method of learning during Aquinas’ lifetime that brought together the thoughts of the ancient classical philosophers with those of medieval Christian theologians. It is a method of learning that uses logic to eliminate what is false. Whatever remains after such an examination must be the truth. This unfinished work is his greatest piece of writing. It is a lengthy document that discusses a variety of theological subjects in great detail. It covers his thoughts on the existence, simplicity, perfection, goodness, infinity, immutability, eternity, unity, life, will, love, justice, mercy, providence, and power of God. And that’s just a very small part of the Summa. He also discusses the creation of all things seen and unseen including a review of the seven-day creation story. It contains writings on the subject of angels including such things as the source of their knowledge, whether they assume bodies, and their will. The Summa has a 26-part statement about the nature of humanity that talks about what is the soul, how the body and soul are united, our free-will nature, how our intellect works to create understanding, and much, much more. All of this is in what is known as the First Part. Some of the subjects in the Second Part are happiness, free will and choices, good and evil acts, love, pleasure, pain, sorrow, fear, anger, habits, virtues, sin, differences in the types of laws (eternal, natural, human, and divine) grace. Aquinas also included discussions on prudence and justice, fortitude and temperance, prophecy, miracles, and religious life. The Third Part starts with 67 topics related to Christ and it finishes with many statements related to the Sacraments. The “Supplement” contains 99 topics ranging from contrition, confession, excommunication, marriage, resurrection, and final judgment. Aquinas believed in two types of revelation from God: general revelation and special revelation. General revelation occurs through observing the seen world. Special revelation is the Spirit alive within us giving specific understanding. He also believed that faith, hope, and charity are three virtues that have God as their object, making them different from other virtues. To Aquinas, theology was a science with the raw material being the written scripture and the tradition of the church. He believed that together, faith and reason process the scripture and tradition to obtain true knowledge of God. The goal of theology is to understand the truth about God and to experience salvation through that truth. The goal of human existence is union and eternal fellowship with God. Aquinas felt that God is neither self-evident nor beyond proof. In the Summa Theologiae, he laid out five proofs for God’s existence. These are widely known as the "Five Ways." God is incapable of change on the levels of His essence and character. God is one, without diversification within God's self. This is a very short article on Saint Thomas Aquinas. Pages and pages have been written about him, his work, and his teaching. To learn more about our patron saint, use any Internet search engine and you will get thousands of web pages with more on this holy man.